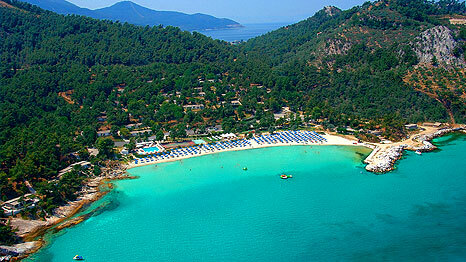 This complex is located only about 2 kilometers outside of Thassos Town and 19 km from Skala Prinos in a quiet bay. It has a beautiful beach where you can enjoy throughout the day. There is a fee of 3 euros to use the beach, money they currently use to maintain the beach in excellent condition, so that if you go and see there the sand is fine, no rocks, crystal clear sea water calm but time to time one visits the stronger wave. It’s perfect for kids of all ages, also there is a place where you can dive to a depth safe. The area is completely surrounded by green hills and mountains covered with pine and other trees. Makryammos Beach Resort offers many facilities and various services, such as a beach bar, restaurant, pool, tennis court, basketball court, playground for children and even bungalows for those who would like to sleep next to beach. Makryammos was awarded the blue flag for many consecutive years.